Flavor with other natural flavors. 35 calories. 5 g whole grain per cake. Deliciously satisfying crunch! 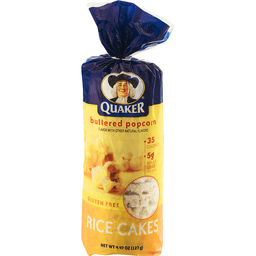 Quaker Rice Cakes satisfy your craving for a crunchy snack that won't make you feel weighed down. 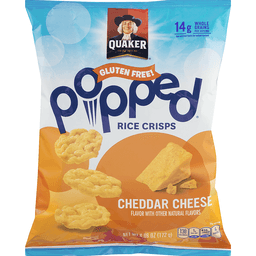 And because they're popped, and made with 5 grams of whole grains, they also satisfy your need to snack smarter. Eat them right out of the bag, or top them with a tasty spread to mix things up. Try Buttered Popcorn Rice Cakes with your favorite salsa or spreadable cheese! With seven delicious flavors, you'll never run out of options. White cheddar. Buttered popcorn. Chocolate crunch. Lightly salted. Apple cinnamon. Caramel corn. Salt free. 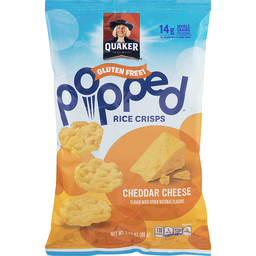 For more information, visit www.QuakerRiceSnacks.com. Questions or comments? Call 1-800-856-5781. Please have package available when calling. Flavor with other natural flavors. Gluten free. 13 grams whole grains per serving. See nutrition facts for sodium content. No high fructose corn syrup. Per Serving: 140 calories; 0.5 g sat fat (3% FV); 350 mg sodium (15% DV); 1 g sugars. Whole Grain: 13 g or more per serving. Eat 48 g or more of whole grains daily. WholeGrainsCouncil.org. 13 g whole grains per serving (see nutrition facts for sodium content). Low cholesterol per serving (see nutrition facts for sodium content). No high fructose corn syrup. Popped. Never fried. New look! Same great taste. Full of flavor. Full of crunch. Made with corn & whole grain brown rice. Great for your next get-together! Questions or comments? Call 1-800-856-5781. Please have package available when calling. Visit us at QuakerOats.com. Per Serving: 35 calories; 0 g sat fat (0%); 15 mg sodium (1% DV); 0 g total sugars. 100% whole grains & other delicious ingredients. No high fructose corn syrup. Gluten free. 8 g whole grains per cake. Whole Grain: 8 g or more per serving. WholeGrainsCouncil.org. Made with brown rice. No artificial flavors or added colors. Cholesterol free food. No added sugar not a low calorie food (See information on sugar and calorie content). New look! Same great taste. 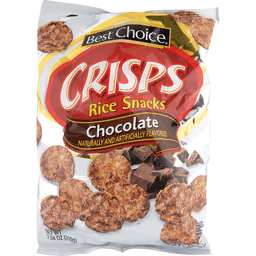 Your go-to guilt-free snack. Try topped with peanut butter, jelly & bananas! Questions or comments? Call 1-800-856-5781 please have package available when calling. Visit us at QuakerOats.com. Flavor with other natural flavors. Per Serving: 50 calories; 0 g sat fat (0%); 25 mg sodium (1% DV); 3 g total sugars. Gluten free. 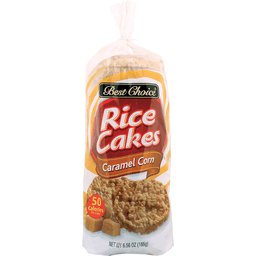 5 grams whole grains per cake. No high fructose corn syrup. No artificial flavors. Low cholesterol. Low fat. New look! Same great taste. Your go-to guilt-free snack. Try topped with cream cheese, peaches & honey! Questions or comments? Call 1-800-856-5781 please have package available when calling. Visit us at QuakerOats.com. 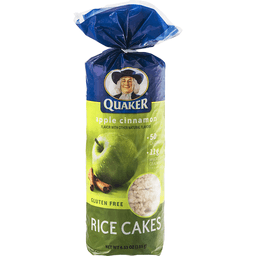 Quaker® Apple Cinnamon Gluten Free Rice Cakes. Flavor with other natural flavors. 50 calories. 9g whole grain per cake. Partially produced with genetic engineering. Satisfying whole grain crunch! 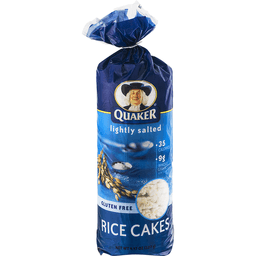 Quaker rice cakes satisfy your craving for a crunchy snack that won't make you feel weighed down. 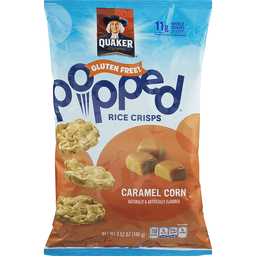 And because they're popped, and made with 9 grams of whole grains, they also satisfy your need to snack smarter. Eat them right out of the bag, or top them with a tasty spread to mix things up. 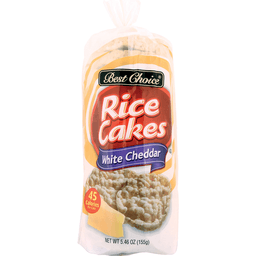 Try apple cinnamon rice cakes with your favorite yogurt or cream cheese! With seven delicious flavors, you'll never run out of options. White cheddar. Buttered popcorn. Chocolate crunch. Lightly salted. Apple cinnamon. Caramel corn. Salt free. Questions or comments Call 1-800-856-5781. Please have package available when calling. 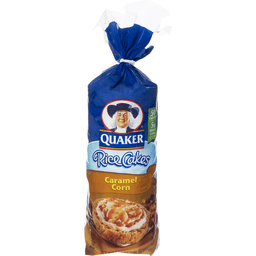 For more information, visit www.quakerricesnacks.com. ©2015 The Quaker Oats Company. Natural and artificial flavors. 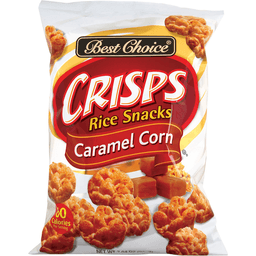 Per Serving: 120 calories; 0 g sat fat (0%); 240 mg sodium (10% DV); 10 g total sugars. Gluten free. 11 grams whole grains per serving (See nutrition facts for sodium content). Whole Grain: 11 g or more per serving. Eat 48 g or more of whole grains daily. WholeGrainsCouncil.org. No high fructose corn syrup. Low cholesterol per serving (See nutrition facts for sodium content). Low fat. Popped. Never fried. See nutrition facts for sodium content. New look! Same great taste. Full of flavor full of crunch. Made with corn & whole grain brown rice. A snack the whole family will love. Questions or comments? Call 1-800-856-5781 please have package available when calling. Visit us at QuakerOats.com.